"The human mind abhors the absence of explanation, but full understanding is never possible. Human understanding is likely to be incomplete at best and, more often, utterly fallacious. To make matters worse, it is likely to be supported as truth and wisdom by religious and scientific authority, intellectual fashion and social convention. 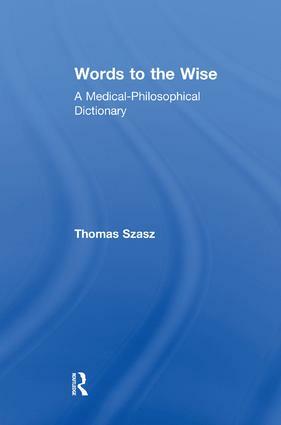 In Words to the Wise, Thomas Szasz offers a compendium of thoughts, observations, and aphorisms that address our understanding of a broad range of subjects, from birth to death.In this book, Szasz tackles a problem intrinsic to the human condition. What problem? In the words of the American humorist Josh Billings: ""The trouble with people is not what they don't know but that they know so much that ain't so."" Many of Thomas Szasz's books have been devoted to exposing what ""ain't so"" about mental illness and psychiatry. Here, Szasz applies the same skeptical spirit to the larger problem of people knowing much that ""ain't so."" About addiction, Szasz observes: ""If a person ingests a drug prohibited by legislators and claims that it makes him feel better, that proves he is an addict; if he ingests a drug prescribed by a psychiatrist and claims that it makes him feel better, that proves that mental illness is a biomedical disease."" About beauty: ""Beauty is in the eye of the beholder; ugliness is in the personality of the beholden."" About libertarians: ""Libertarians regard liberty as contingent on the right to property; scientists regard disease as contingent on pathological alteration of the body. All libertarians reject the notion of 'socialist liberty,' yet many accept the notion of 'mental disease.'"" Or about power: ""Many of my critics say I am hostile to medicine and physicians. They are wrong. I am hostile only to the power of the medical profession and of physicians. ""Szasz notes that despite enormous social pressure for a shared perspective on how the world works and how we ought to live, every person'saunde"